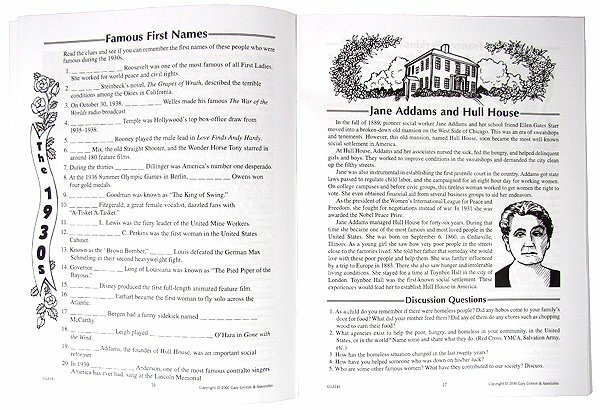 Trivia Book for Seniors. 1930's Book. This 1930's activity book contains a variety of puzzles and games for seniors that help them remember events from the 1930's. There are also fun activities for seniors that they can do by themselves if they live alone. This 1930's activity book measures 8 1/2" x 11", comes in standard size print, has 48 pages and a soft cover. It displays important people & occasions that took place in the 1930's. 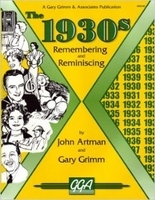 The book includes discussion questions (if doing with a group of people), mini biographies of important people, word searches, scrambles, inventions and new products, new music from the 30's, fill in the blank activities, historical events and information, facts about the president, athletes from the 1930's, and other fun activities. These activities for seniors will bring back many memories of their life and will greatly enjoy this book. There is an answer key included at the back of the book. See our other games for senior citizens. My grandma loved this book of nostalgia and trivia. She said it was really a unique gift for someone born in her decade.